Robert Kendall was Elvis’ funeral director of the Memphis Funeral home who arranged all the procedures for the burial of Elvis Presley. Having arranged the funeral service for Gladys Love Presley, Elvis’ mother, 19 years previously Kendall thought is only appropriate that Elvis should be buried in an identical $8,000 casket as his mother. The copper lined casket also provided a two by 4-inch stainless steel cylinder for identification purposes in the event the remains, in the future are exhumed. 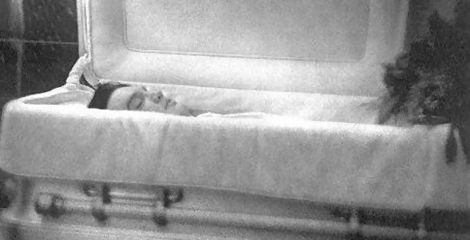 Priscilla and Lisa Marie attend Elvis Funeral Usually, Robert Kendall discourages family to place valuables inside the coffin for the most obvious of reasons and made that clear to Vernon Presley, however, this time against his better judgment he allowed a small token from Lisa Marie who was only nine years old at the time. During the first day of private viewing Lisa Marie approached Kendall while still holding her mother’s hand and asked, “Mister Kendall can I give this to my daddy?” With that she held out her other hand to display a thin metal bracelet. In this case being only a child Kendall could deduce that Lisa Marie was terrified to touch her beloved father’s body. Instead of taking the bracelet from Lisa Marie, Kendall took her hand walked her to her daddy’s bier. 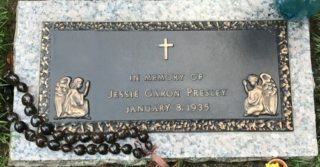 Lisa Marie Presley holding the bracelet approached the casket. She did not look at the father’s body when Kendall asked her to point to which wrist she wanted Kendall to put it on. Instead of pointing to her daddy’s wrist she pointed to her own right wrist. Kendall realised then that already in her tender innocence Lisa has an innate aversion to touching the corpse of a person she loved so very dearly. Thus it was left to Kendall who gently lifted her father’s right forearm just enough to slip the trinket into place. Lisa Marie looked down at the floor throughout the whole procedure. “Thank you, sir…” whispered Lisa Marie while walking hand in hand with Kendall until she reached her mother in the hallway. Just before she turned to walk away, Lisa Marie questioned Kendall… ” Will it stay there always?..” Kendall assured her that it would be there forever. As Lisa Marie headed for the front door, Priscilla Presley asked if Kendall would cover the bracelet with the shirt cuff so it couldn’t be seen. Although she did not offer any reason Kendall suspected that it was so that it would remain safe without temptation to be taken as a final memento. Thursday, August 18, the funeral procession was an 21 car cortège. Celebrities, Ann-Margret & Colonel Tom Parker attending the funeral service. Jackie Kahane gave the eulogy & Kathy Westmoreland sang Heavenly Father. The pallbearers at Elvis’ funeral were, Jerry Schilling, Joe Esposito, George Klein, Lamar Fike, Billy Smith, Charlie Hodges, Gene Smith and Dr. Nichopoulous. “Son, Daddy will be with you soon. Daddy will be with you soon,” cried Vernon Presley. Two years later on 26 June 1979 Vernon Presley died of a broken heart.